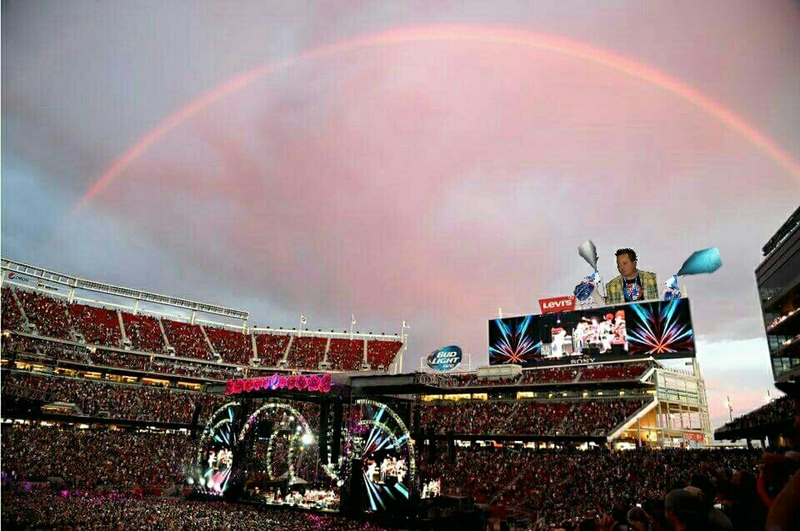 In shocking news, pictures obtained from Security cameras at Levi’s Stadium in Santa Clara show irrefutable evidence that the Rainbow that appeared during dusk on June 27th was indeed man made. The photos were gathered from Security cameras mounted inconspicuously around the stadium providing somewhat clear images of what took place that night. We tried to contact members of the production team for comment but apparently they made a ton of cash and are all currently on vacation… Here’s the evidence supporting the production team’s work creating a rainbow above the Stadium. Um…you’re right up there with Kermit. Maybe you caused it. Love a Kermit reference anytime I can get it. Only in Deadhead land xo. so you’re telling me they wanted to soak us to the bone at Alpine in ’89? Try being at the beginning of set 2 Pitt 95’…They were regular meteorologists. Green frogs and rainbows…….I’ve been to similar shows, sorry I missed that one. Love life, laugh, live with a passion, any passion will do and if it happens to involve green frogs and rainbows……bless you my friend…. hahaha! you so funny Dean so Tilly! Uh… I was there. Did they make they rain too? they shoulda spent the dough on a hologram, Jerry playing a set with the lads. Did they ever record him in concert ? They could’ve used one of his old noodlings.